The CMA’s Word of Mouth Conference kicks off tomorrow morning in Toronto. I’m really looking forward to moderating a panel on Ethics of Word of Mouth with Malcolm Roberts , President, Smith Roberts Creative Communications and Ross Buchanan, Director, Digital & Relationship Marketing, Molson Canada . We’ve had a preconference discussion and I know that Malcolm and Ross are ready to be thoughtful and provocative in leading this discussion. But just as much, I’m looking forward to all the other great speakers who conference chairman Sean Moffitt has lined up. If you’re planning to be at the conference and you see me there, please grab me by the arm and say hello. LAST MINUTE BONUS: Sean has offered me the opportunity to invite a some of my colleagues to register at a $50 discount. I’d like to share this offer with my blog community. If you read this post and register today to attend the conference, let me know and I’ll arrange for the $50 discount to be applied to your registration. Ethics and Word of Mouth Marketing – What are the issues? What do you think are the most important ethical issues relating to Word of Mouth marketing? I’m chairing a panel on Ethics of Word of Mouth at the CMA’s Word of Mouth Conference next week. The panelists discussing this issue with me will be Malcolm Roberts , President, Smith Roberts Creative Communications and Ross Buchanan, Director, Digital & Relationship Marketing, Molson Canada . As I prepare for this session, I’d welcome your input. What are the major ethical issues confronting the Word of Mouth industry? What questions would you put to the panelists and participants? I’ll use your suggestions and questions at the session. So, please fire away. 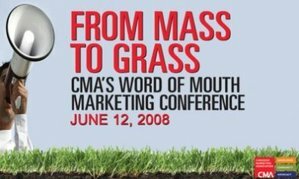 On June 12, I’ll be moderating a session at From Mass to Grass, the Canadian Marketing Association‘s annual Word of Mouth Conference. This looks to be a great day packed with some of Canada’s top experts on word of mouth marketing and social media. Sean Moffitt, the Chair of the conference has a post with a rundown of the speakers and sessions. And if you join the From Mass to Grass Facebook Group by May 1, you will receive a $50 discount off the registration fee for the conference. A great lineup. I hope that I’ll see you there. And remember to register before May 1 to obtain the $50 discount.